Lot Detail - Tod Sloan's Circa 1955-56 Toronto Maple Leafs Game-Worn Alternate Captain's Wool Jersey with Family LOA - Team Repairs! 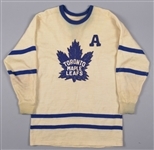 Tod Sloan's Circa 1955-56 Toronto Maple Leafs Game-Worn Alternate Captain's Wool Jersey with Family LOA - Team Repairs! 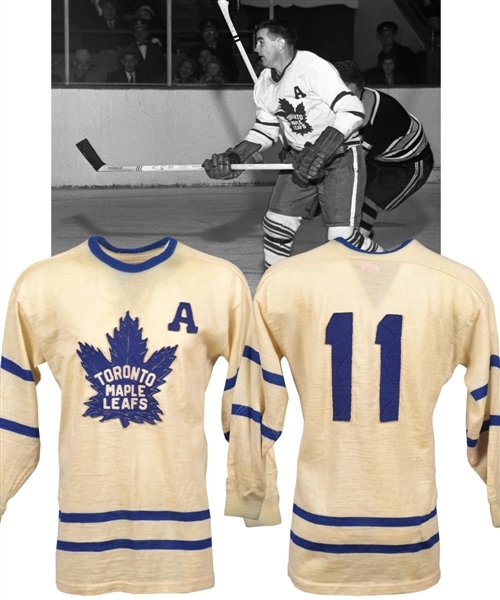 After spending the 1949-50 season with the Cleveland Barons of the AHL, Tod Sloan would make his return to the Toronto Maple Leafs in the fall of 1950, with his inaugural season with the Leafs occurring in 1948-49. 8 successful seasons would follow in Ontario, including appearances in three NHL All-Star Games, in 1951, 1952 and 1956. Sloan would also hoist a pair of Stanley Cups with the blue and white, in 1949 during his rookie season, and again, after the Leafs defeated Montreal when Bill Barilko scored his famous and lamented goal in overtime of Game 5 of the 1951 Stanley Cup finals. Originating from the Sloan family and making its hobby debut, we have an especially desirable vintage Toronto Maple Leafs wool sweater, with this specimen worn by Sloan and seeing use during his most productive season in 1955-56, with 66 points scored in 70 games. Doug Laurie labeling is affixed to the collar, with the MLG address of the longtime Leafs supplier noted, with the vintage wool measuring-out to roughly a size 48. Featuring a gorgeous and highly detailed felt maple leaf team crest with “Toronto Maple Leafs” added in individual felt letters, an alternate’s A in matching material has been placed over the left breast, along with “11” over verso, affixed with zig-zag pattern attachment. Dual striping bands have also been utilized over the waist and sleeves, with the collar embellished in matching Leafs’ blue. The placement of the alternate captain’s A matches a pair of photos from the 1955-56 season, with no other examples we located showing the correct placement. One of these photos also shows the matching configuration of the various tips of the team crest, but it is not high resolution enough to call a definitive photo-match. 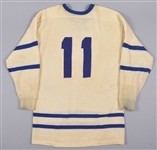 It should also be noted that the 1955-56 season was the first Sloan wore the number 11 sweater. Surviving in a wonderful state of preservation with a clean team crest and supple material, just a few random marks are visible, with the blue colour over the collar bleeding into the surrounding material somewhat. Both cuffs are also discoloured, with a few minor stains present, including near the reverse numbers. There are also team repairs, with examples over the lower back, right shoulder and left sleeve (3). Combining the factors of age, condition and pedigree, this highly sought specimen would be a significant highlight in any advanced Leafs, Original Six or vintage wool collection. An LOA from the Sloan family will accompany this thought-provoking treasure.